The medals just keep coming for the Albritton Skis Team, and with a few more events coming up, odds are the influx isn’t over. Just last weekend, Axl Bonenberger, a 10 year old ripper, and Albritton Skis rider from Breckenridge, CO placed first in the both the USASA National Slopestyle and halfpipe competitions held at Copper Mountain. He took home the gold in the Slopestyle competition after throwing down a left 360 mute grab, a right 360 japan grab, a left 720 tail grab, a right foot rail slide, wrapping it all up with a right foot rail slide front 270 out. After stomping the Slopestyle competition, he headed over to the halfpipe and threw down yet another first place run consisting of a right side alley-oop to a left side alley-oop, a left side 540 to a right side 540 straight air, throwing in a hand plant 180 at the end of his run for good measure. Wanna see Axl in action? Check out his newest edit “A Day in the Life of Axl Bonenberger” on our Media page. Team rider, Austin Porzak has done in again folks! During his most recent ski endeavor, Austin managed to pull off the unthinkable, and ski the first flatiron from top to bottom. In doing so, he became the first person to successfully ski this unbelievably difficult line. Austin is constantly out in the Colorado back country, pursuing his dreams and pushing the limits on his trusted 189 Tomichi in every possible way that he can. If the recent conditions keep up for the remainder of the season, Austin will undoubtedly accomplish his goal of skiing all 58 of the 14,000 foot peaks in CO. Having done 54 of the 58,there's no stopping this guy now. Congrats, Austin! We can't wait to see what's next. Check out his bio here to see more great shots of this descent and many others. Albritton Skis is proud to announce that we will be sponsoring the 42nd Anniversary Colorado Peace Officers Ski and Snowboard Race taking place on Friday, March 13th, 2015 at Vail Resort. In honor of this event, Albritton Skis will be donating a custom ski based on their popular All Mountain Freeride ski, the No Name, featuring special branding from the Town of Vail & the Town of Vail Police Department. The race is open to all sworn and non-sworn police department personnel including retired law enforcement. We are excited and proud to support the local Colorado community, especially those who have put their lives on the line in order to serve and protect the citizens of the great state of Colorado. The Albritton Skis team would like to congratulate Thomas Macgregor on yet another podium finish! Thomas participated in a slopestyle competition at Treetops Resort in Northern Michigan this past weekend and placed second after laying down a Bio 720 Japan and his first ever Cork 720. Keep killing' it up there, Thomas! Check out Thomas on Instagram to see what else he's been up to this season. For the first time this season, the entire Albritton Skis team will be assembling in Denver, CO for the SIA Snow Show. This includes our local Colorado team that services all of our customers and shops around the state, our sponsored riders, A-Team ambassadors, and even our team members from across the country. For those of you that don't know, the SIA Snow Show has been bringing the entire snow sports market together in one place for six decades, making it the most important trade event for the entire industry. Showcasing the latest trends, innovations, product lines and styles, the SIA Snow Show represents the only global event where over 1,000 brands are presented in an authentic environment both on and off the snow; all powered by the passion and culture of snow sports. While Albritton Skis will not have a booth set up at the show this year, we will still be on the floor, checking out all of the awesome products that this industry has to offer. If you don't run into us at the show, please feel free to contact us at info@albrittonskis.com if you would like to get in touch, meet the team, and learn more about our products while we are in Denver. We are always excited to hear from and meet our customers and other passionate skiers. Hope to see you at the show! The Albritton Skis team would like to welcome new team rider Cam McLellan to the A-Team. Cam is a certified ACMG- Ski Guide out of Invermere, BC and has been working in multiple facets of the avalanche and ski guiding industry for 7 years. Cam is currently representing Albritton Skis in the Esplanade Range in the northern Selkirk Mountains of British Columbia, Canada on a week long tour of Golden Alpine Holidays. He is showing the ladies of Full Moon Films (Marie France Roy, Annie Boulanger, Helen Schettini, Leanne Pelosi and Robin Van Gyn) their way around the back country while shooting for Transworld Snowboarding. Best of luck up there, Cam! Can't wait to see the photos and videos you guys bring back. 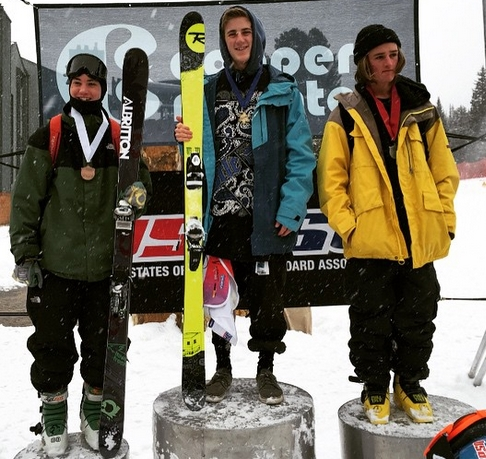 The Albritton Skis team would like to congratulate A-Team sponsored rider, Christian Shackelford on his 3rd place finish in the Copper Mountain slopestyle competition this past weekend. Christian is another one of our riders reppin' the SkyHawk park skis and has been pushing them to the absolute limit this season. With multiple competitions for this young ripper coming up, our team here at Albritton Skis can't wait to see what he pulls off next. Great stuff Christian! The Albritton Skis team would like to congratulate A-Team sponsored rider, Thomas Macgregor on his 3rd place finish in the Mt. Brighton slopestyle competition this past weekend. Thomas is one of our young up and coming riders and has been rocking the competition on his SkyHawk park skis. Keep up the good work Thomas! Hello! And welcome to the new Albritton Skis website! We've taken some time to re-vamp our website in an effort to provide our customers with more information about our products, our company, and the Albritton culture. We are continuously growing and always looking to find new ways to better serve our customers, and appreciate all of the continued support from all of you. Now get out there and "Master Your Mountain!" Copyright Ⓒ 2014 Albritton Skis. All Rights Reserved.